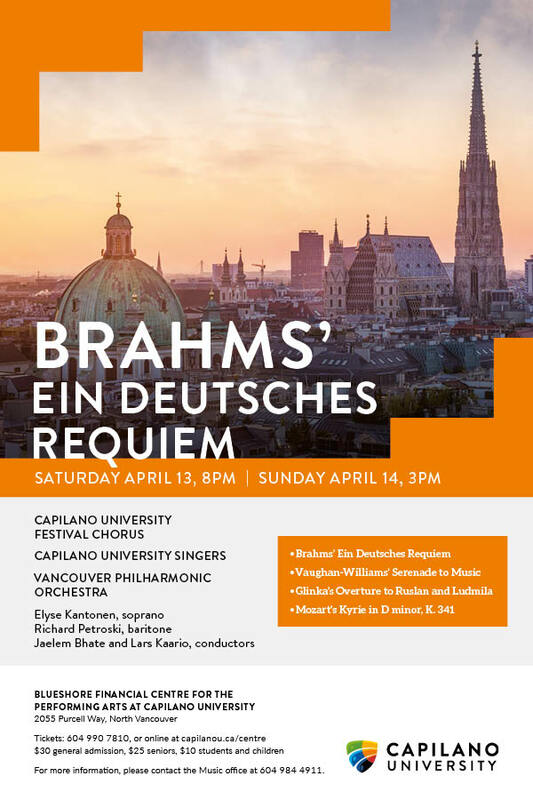 The beloved classic, Brahms' Ein Deutsches Requiem, is the focus of the April 13 & 14 concerts by the 110 voices of Capilano University Choirs and the Vancouver Philharmonic Orchestra. Brahms chose to write this piece in his native language, German, and chose Biblical texts which he believed would give comfort to the living. Indeed, it is thought his own mother's death inspired him to write it. More than 150 years later, this major work by Brahms remains a powerful, moving and hopeful piece. The choir and orchestra will be joined by guest soloists Elyse Kantonen, soprano and Richard Petroski, baritone. 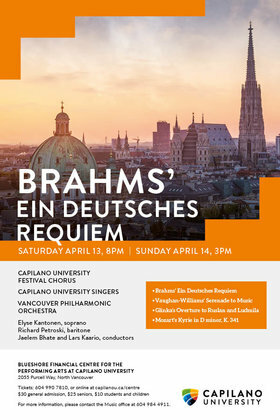 Other repertoire includes the dark and brooding Kyrie in D minor by Mozart and the sublime, impressionistic Ralph Vaughan Williams' Serenade to Music. The Serenade is an ode to the power of music and uses Shakespearean text. Beautiful! The Orchestra will also play the exuberant Overture to Ruslan and Ludmila by the Russian composer Mikhail Glinka. Powerful, moving, brooding, sublime, exuberant. Prepare to be thoroughly captivated!